One of the first questions that popped into my mind after watching "Fatty Boom Boom" is what the hell was that? I came across the South African group Die Antwoord while trying to dig deeper into Neill Blomkamp's Elysium. It turns out that Die Antwoord's frontman, Ninja, was Blomkamp's first choice for the role played by Matt Damon. I learned this via a review by Steve Sailer that I read after I watched the film. Sailer claims the "American culturati's hive mind" has got Blomkamp, who also directed and co-wrote District 9, all wrong. According to Sailer, Blomkamp is a "young Boer refugee" and his new movie is "about the horrors of mass immigration and nonwhite overpopulation". It is, like District 9, "another Malthusian tale" by Blomkamp, "a gun-loving Afrikaner whose movies are based around his fear that the rapid breeding of Third Worlders threatens to bring down civilization". I'm not sure if Sailer is right about Blomkamp or his cinematic intentions but he makes a compelling case and his review put the film in a different light for me. Sailer also opines that "Elysium would have been more interesting with either" Eminem or Ninja in the lead and refers to Die Antwoord as "a satirical Afrikaner duo who are always on the verge of getting denounced as racist." I'd never heard of Die Antwoord before and was intrigued. Below is Die Antwoord's "Fatty Boom Boom" video. Following that is their response to some comments on the video by YouTube users (you can also watch a 'making of' video here). The last video is an illuminating video essay by Chris English entitled "Wat Kyk Jy: Die Antwoord and the Appropriation of Jane Alexander's Butcher Boys". Jane Alexander is a South African sculptor whose 1985/86 work, The Butcher Boys, is widely recognized as an artistic critique of South African apartheid. Source: Character of Abbot Jethras Zerchi in A Canticle for Leibowitz (Bantam Books, 1959, 2007) by Walter M. Miller, Jr. This will be my fifth post mentioning One Flew Over the Cuckoo's Nest. Yesterday, I finished reading A Casebook on Ken Kesey's One Flew Over the Cuckoo's Nest by George J. Searles, ed. (Univ. of New Mexico Pr., 1992). Several of essays in the book make mention of the Christian symbolism in Cuckoo's Nest. This theme is central to one essay in particular, Bruce Wallis' "Christ in the Cuckoo's Nest: Or, the Gospel According to Ken Kesey," which was first published in Cithara 12:1 (November, 1972). Below is an excerpt from Wallis' article. ... the novel is expressly formulated as nothing less than the bible for a twentieth-century religion of self-assertive action, with a message of salvation modulated to the needs of repressed individuals in a constrictively conformist society. The analogy between the lives of McMurphy and Christ is thus fairly complete, and the elements composing it are too numerous and too sustained—especially in their repetition—to be accidental or incidental. The analogy functions to elevate the action of the novel to a high plane of significance, for it suggests that contemporary civilization is suffering from a spiritual illness so severe, that a redirection of spiritual focus, such as that effected by the life and death of Christ, is in order. The analogy makes of the novel, moreover, a bible for contemporary action, because by systematically comparing McMurphy to Christ, it implies that the life of this contemporary redemptive figure must, like the life of Christ, offer a pattern for active emulation. The analogy culminates in the author's assignment of the narration to the particular "you" that the "giant come out of the sky" has most dramatically saved from the cuckoo's nest. In narrating the life of the martyred McMurphy, Chief Broom has become an apostle in the fullest sense of the word. That the gospel Chief Broom prepares is intended for serious adoption by its readers is evidenced by Mr. Kesey's ensuing endeavor to emulate R. P. McMurphy's experiences in his own life. The failure of that endeavour, the dropping away of his own disciples and of the crowd of followers he initially collected, suggests that the doctrine he formulated in theory cannot be effected in practice. [The "failure" Wallis is referring to here is Kesey's 1960s escapades with the "Merry Pranksters" as documented by Tom Wolfe in The Electric Kool-Aid Acid Test. I haven't read Wolfe's book but I have seen Magic Trip, the 2011 documentary of the 1964 cross-country bus trip by Kesey and the Merry Pranksters, and on that basis concur in Wallis' judgment.—VFPD] The cause of its practical failure is not hard to discover, for the religion he postulates, that of self-aggrandizement (call it by any contemporary term: "doing one's own thing," to the cost of the social fabric), fails to take into account original sin--the ineluctable depravity of man for which religion alone is necessary to atone. It is no difficult task then, within the configurations of a purely fictional action, to demonstrate the felicitous effects of independent and self-centered activity. One is bound to sympathize with a fictional hero who performs as an adult the pranks we all engaged in as children but are inhibited from indulging in as adults ourselves. It is also safe to suppose that the people around such a hero, moved by a like sympathy with his basic human desire to indulge the self, will feel a natural inclination to act the way he does. But one is not bound to make a logical extension of fiction into fact, nor to suppose that such self-indulgence will have in reality the same meritorious outcome that it can be manipulated to achieve in art. One cannot gainsay the author's contention that the self-abnegation implicit in our conformity to social and ethical norms is dangerously frustrating. In theological, as well as psychological terms, it is inevitably frustrating to attempt to contain the beast within. Yet life presents little evidence that the release from frustration attained by allowing that beast a freer rein is to be more desired than feared. It is ironic, of course, that Mr. Kesey should compare directly to Christ, the paradigm of humility, a man whose life is intended to exemplify the value of pride. Rather than lose the self in order to save it, the gospel according to Ken Kesey suggests, one must assert the self in order to save it. In contradiction to the fundamentally Christian view of human depravity, which considers the self one might assert as a potential Kurtz in the jungle, Mr. Kesey has predicated his novel upon the romantic philosophy that man is naturally benevolent, and that his natural actions, undistorted by the pressures of social necessity, will invariably conduce to the greatest good. Mr. Kesey fails at any point in his novel to consider the possibility that the natural, self-assertive actions of his protagonists might be at least as often destructive as the presumably unnatural actions of his antagonists—that all human action will in fact be subject to the same human limitations. The problem in Mr. Kesey's philosophy is not that the Combine, his word for the establishment, is less evil than Mr. Kesey supposes (although it may possibly be so). It is rather that it is not the Combine which generates the evil Mr. Kesey observes, but the evil which generates the Combine, or at least makes of it what it is. The flaws in the system exist only because of anterior flaws in the men who created and maintain it. Attacking the system itself is attacking the symptom instead of the disease. That alternative systems will fall heir to the same human failings Mr. Kesey discovered. His Utopia collapsed as Utopias have persisted in doing. But Mr. Kesey's Utopia was more foredoomed than most, since his prescription to combat the symptom, as we see in One Flew Over the Cuckoo's Nest, was simply a larger dose of the disease. The most fundamental precept of the religion Mr. Kesey exploits for his literary analogy is the danger of pride, the original sin in the sense of that self-love or self-absorption that makes all other sins possible. Yet the cardinal virtue in what might be termed the "cuckoo philosophy," repeatedly exemplified by McMurphy despite his paradoxical (and improbable) self-immolation, is that very self-loving self-assertion. Kesey suggests that by throwing butter at walls, breaking in windows, stealing boats, and doing in general whatever comes naturally, the inmates will become carefree and vital individuals at last. A Utopia composed of such self-centered children can spare itself the trouble of making any long-range plans. Wallis' article was published in a journal of a Roman Catholic institution, St. Bonaventure University. One need not subscribe to Roman Catholic doctrine on, for instance, "original sin" to see the strength of Wallis' case or to appreciate the depth of his analysis. In fact, I don't completely agree with Wallis and I still like Kesey's novel but I do appreciate that Wallis has helped me to see more in the book and to see it more truly than I had before. This post is dedicated to Gloria. Take a close look at "Big Bertha"—the world's largest tunnel boring machine—in the photo below. At the top you'll see that some American jackass has hung an American flag. This flag-waving expression of nationalism is ridiculous and out of place. 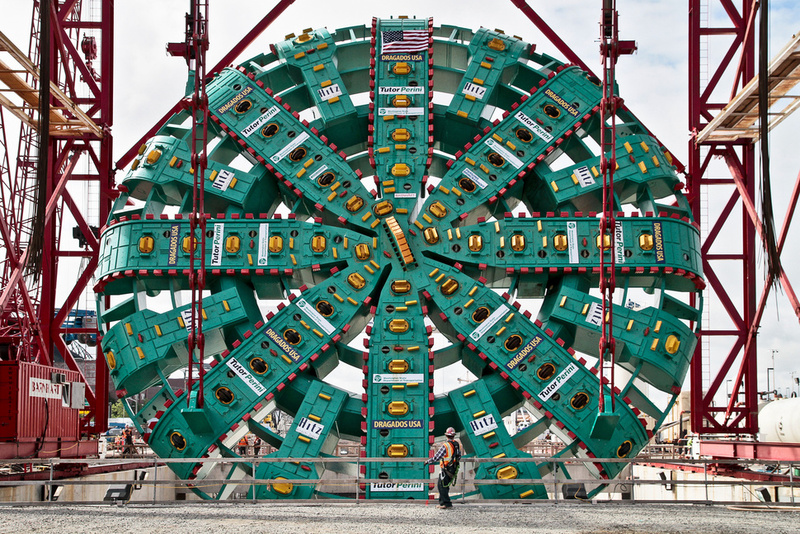 You see, Big Bertha is being used to dig a tunnel in Seattle but the machine was built in Japan by Hitachi Zosen and the main contractor for the project is Seattle Tunnel Partners, whose majority stakeholder is Dragados USA, a wholly owned subsidiary of the Spanish conglomerate Actividades de Construcción y Servicios, S.A. The tunnel project is also a not-fully-funded $4.25 billion (if, miraculously, there are no costs overruns) publicly financed, pro-car Big Labor/Big Construction boondoggle. On second thought, maybe Old Glory does belong up there.